Heading to Winchester, Virginia to look for a little history or enjoy a weekend getaway? As you wander the historic downtown district in this city about seventy-five west of Washington D.C., you’ll see the old courthouse building which dates back 1840. If you’ve been touring around Winchester with notes from our previous blog posts (George Washington’s Office Museum, Abram’s Delight, Stonewall Jackson’s Headquarters), then there’s a chance you’ve already strolled by the old courthouse. If you’re just arriving in town, follow the GPS or town signs for historic downtown and head for the pedestrian mall – aka Loudon Street. If you enter Loudon Street from Cork Street, the courthouse will be on your right in about halfway between Cork and Picadilly Streets. Just north of Boscowan – if that information helps? 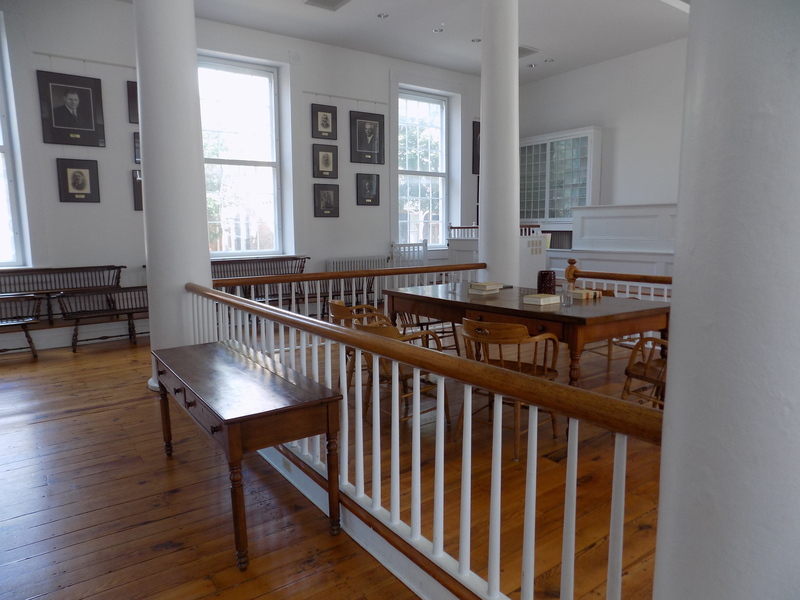 Be sure to check out the courtroom which is usually set up for its pre-Civil War appearance and consider how the jury system and principles of justices play such important roles in local communities. As you ascend the staircase to view the upper level and historic displays, look up as you enter the exhibit room. The bell tower is above you. Sometimes, the bell rope is hanging down and you can ring it and hear history echoing across Winchester once again. 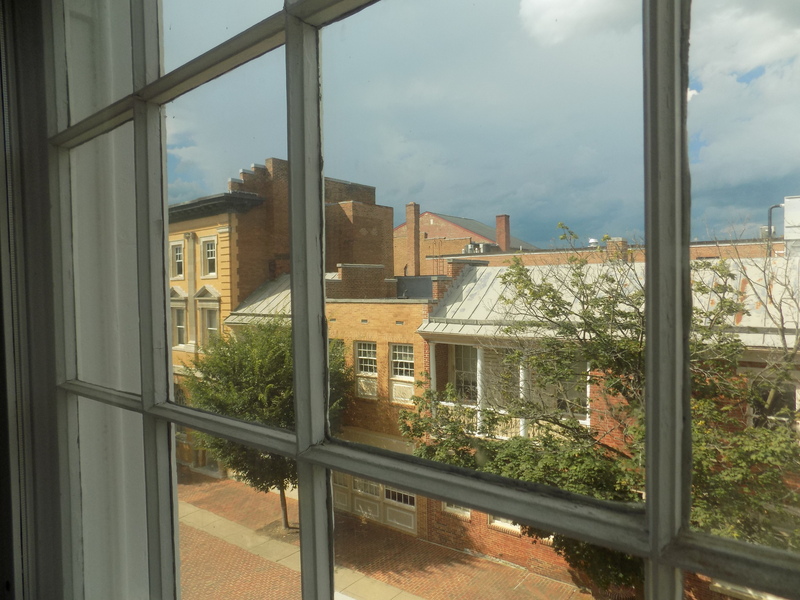 From the upstairs windows, enjoy the view at the historic buildings on either side. Known as lawyers’ row, this area is where many law offices were originally located. 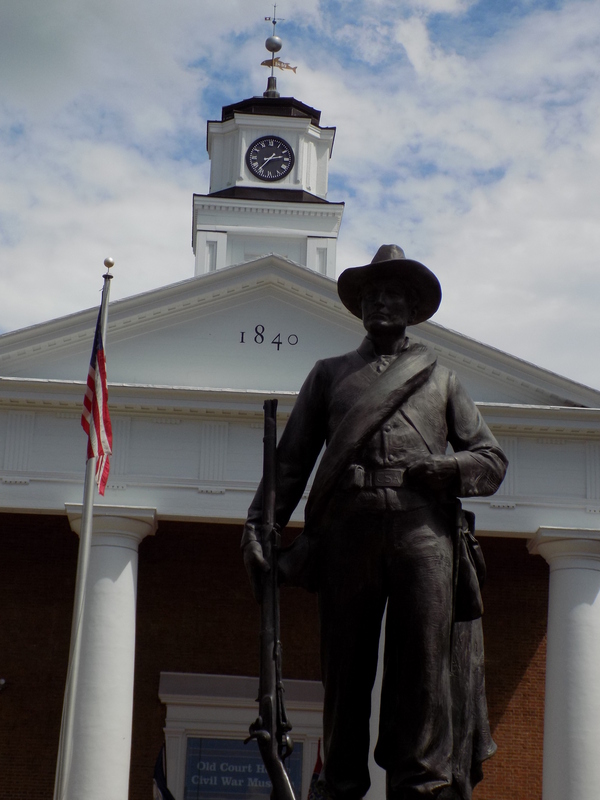 Don’t miss the statue of the Civil War soldier in front of the old courthouse! And if you “cannot live without books,” the museum shop offers a nice selection. Winchester was the seat of Frederick County, Virginia – meaning it was the most prominent town in the county and the place where all official business had to be transacted. Thus, Winchester got the county courthouse. 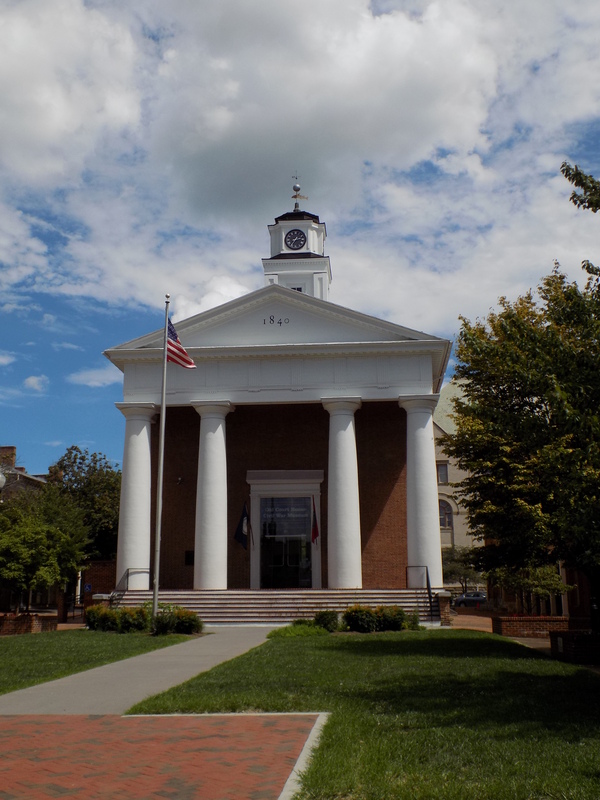 The first courthouse in Winchester – built in 1741 – became the first judiciary building west of the Blue Ridge Mountains. The structure currently standing and built in 1840 rested on the foundations of that Colonial Era court, giving this land and the surviving building a significant backdrop for legal disputes and poised at the very center of this bustling small city in the Shenandoah Valley. During Civil War, the old courthouse took a variety of roles as both sides – Union and Confederate – engaged in a three year struggle to capture or recapture, occupy or reoccupy the strategic town. Both sides converted the courthouse for use as a prison, hospital, and barracks. Soldiers who stayed inside etched their names, drew pictures, and even wrote a “curse” on the plastered walls upstairs. For civilians remaining in Winchester, the courthouse and its flag pole became the symbol of which side held the town. As the town changed hands (at least seventy-six times during the war), the new bosses in town would run up their flag at the courthouse. A Federal flag or Confederate flag fluttering at the courthouse was one hint of which side was in town for a few hours, days, or weeks. Inside the old courthouse, The Shenandoah Valley Civil War Museum presents the judicial history along with impressive displays of Civil War artifacts with stories and interpretation. Over 3,000 artifacts – from bullets and buttons to cannonballs and guns – provide a glimpse of 1860’s history in Winchester and the Valley. Also, carefully preserved in different areas of the building is original soldier graffiti. No, the Civil War era soldiers weren’t supposed to be writing on the walls and defacing the building, but their scribblings offer insight into who was staying in the courthouse and what they thought about the conflict. When you’re finished at the old courthouse and its museum, head north on Loudon Street. Not far from the courthouse on your left is the reconstruction of the Taylor Hotel. Its easy to spot with its multiple levels and columned porches. Rebuilt like the original structure, the modern replica houses apartments and is not open for historic touring. However, the original Taylor Hotel was a prominent landmark in Winchester history – like the courthouse. Generals stayed there, too. Continuing farther up Loudon Street, you’ll find a great local bookstore at the corner of Picadilly. If you haven’t collected enough Civil War books, it’s a great place to buy more local and regional history volumes that you might not find anywhere else. They also usually stock historical maps of Civil War Winchester which are fabulous resources. Add Winchester Book Gallery to your destination list for the visit! Do you have a favorite historic courthouse? I’d love to hear about it in the comments to add to my own travel lists. Yes! I had seen that the Round Table meets at the Old Courthouse. That is awesome. Ah, to be back on Loudon Street… Burgers at the Taylor Hotel sounds amazing and I know you only recommend good places to eat.